Aaaaand it's the third edition of the February boxfullove catch-up posts! The number of sub boxes stacked up in my living-room is more or less steadily decreasing. I'm hoping to be caught up to March by the end of the weekend. Ambition is healthy. In early February, Julep announced the release of its three Cupid's Mystery Boxes: a manicure-themed box, a pedicure-themed box, and a makeup-themed box. Each was available separately from the Julep Maven subscription, cost $24.99, and promised a value of at least $75 worth of products. The contents were kept secret with the exception of one pink-based, Valentine's-inspired polish reveal per box. I picked the Aphrodite pedicure-themed box plus an optional mystery $10 add-on, and got to waiting. Aphrodite turned out to contain three polishes, a foot cream, a food treatment and protection stick, and a foot file. Pretty fantastic haul for a $25 value. I missed the inclusion of an info card, but I don't think any of the mystery boxes come with them. Luckily all Julep's products are clearly labeled. Aphrodite, the box's namesake and only spoiler, a rose with silver metallic microglitter. Gorgeous (the gateway catnip that convinced me to get this box) and surprisingly wearable. I can't find it anywhere on the Julep site now, so I imagine it must have been a limited-edition release. Karen, a "peach bellini frost" creamsicle-orange shimmer polish ($14.00 regular price, $2.99 Maven price). Claudette, a smoky brick red crème polish ($14.00 regular price, $4.99 Maven price). Far left is the Doublestep Foot Treatment and Friction Stick ($22.00 regular price, $17.60 Maven price), which is a solid push-up shea butter treatment that moisturizes feet and acts as protection between sensitive skin and shoes. I have yet to try this one, but if it really works, it's one of the coolest and most useful inventions of the decade! To the right is the Mint Condition Pedi Crème ($20.00 regular price, $16.00 Maven price), which is an ultra-moisturizing, fresh mint-scented cream you smooth onto feet to treat rough skin. I applied this cream to my feet before bed a few nights ago and slept in comfy socks; when I woke up in the morning, my feet were seriously baby-soft and moisturized. Worked beautifully on my poor abused feet, which spend an unconscionable amount of hours per week confined in heels and rushing about an office. 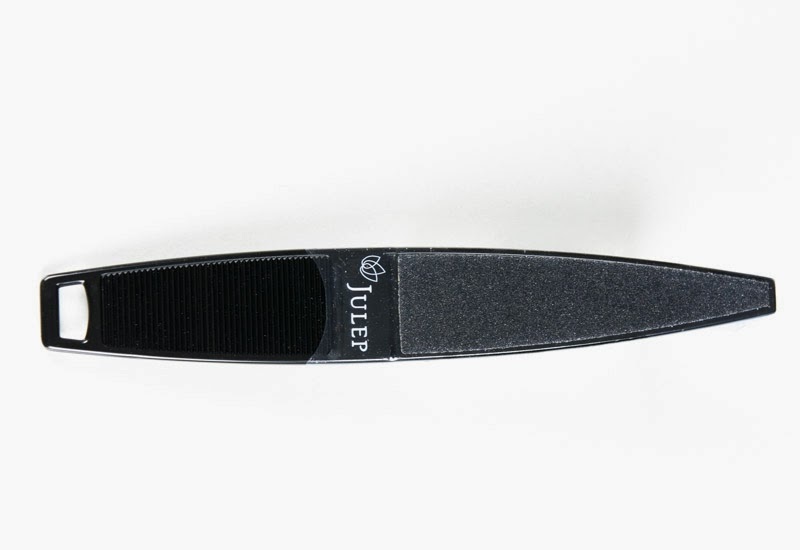 The Julep Foot File ($6.00 regular price, $4.80 Maven price) rounded out this box of pedi essentials and, along with the crème and friction stick, will absolutely come in handy to smooth out the inevitable rough patches. The $10 mystery add-on came in its own separate box. I had no idea what to expect from this guy, but I was hoping for some limited-edition surprises or polishes or products. Instead, I received three more bottles of regular polish. I confess: I was a little disappointed. These looked to me like leftover, slow-selling polishes that might've been included to clear out extra inventory. Angela is a "deep sea blue molten" metallic polish ($14.00 regular, $6.99 Maven). Stefani, a gold-flecked gray metallic ($14.00 regular, $6.99 Maven), is my favorite of the three: a moody, city-chic shade. 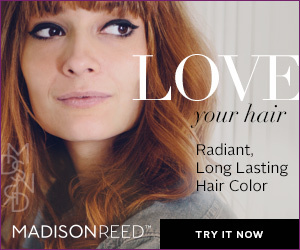 Kennedy is a super-straightforward khaki crème ($14.00 regular, $3.99 Maven). Ok, tally time. So my Cupid's Mystery Box was $24.99, + the $9.99 add-on, = $34.98. The total value of the goodies I received, using Julep Maven prices (since I am a Maven after all), comes to $64.35 without the Aphrodite polish, which I'll guesstimate at anywhere between $6.99 and $14.00. So I did, after all, receive about $75 worth of product! I may not be completely smitten with each of the polishes I received, but I love the pedi products and a couple of colors, and in the end the box is still an excellent value. If you're into these mystery boxes, you'll be happy to know that, although the Cupid's variations are no longer available, Julep has released a brand-new mystery box for March! Shannon comes with its namesake pale minty silk polish (pictured above) plus $100+ worth of polish and products. Aislinn comes with this edgy black polish with green glitter, plus $100+ worth of polish and products. Taryn comes with a deep sea teal holographic glitter polish, plus $100+ worth of polish and products. And finally, there's the 100% Mysterious Lucky Mystery Box, which features zero spoilers and which, as of this posting, is unfortunately out of stock. 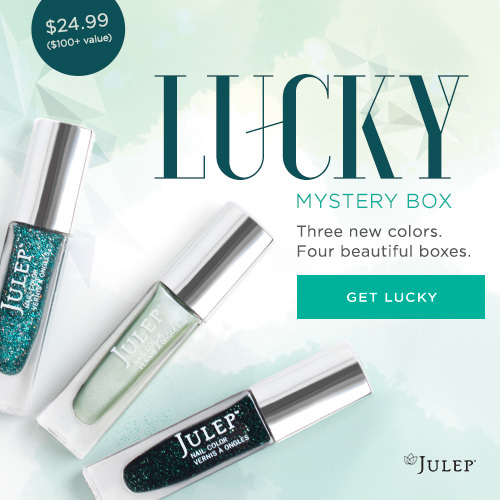 My Julep polishes have been multiplying at an alarming rate, bunny-style, over these past few months, so before they run me out of my apartment I think I'm going to exercise some restraint and pass on the Lucky Mystery boxes. What about you guys, are you planning on taking the plunge? Which Lucky box will you choose? And what did you guys think of the February Cupid's Mystery box? Which one did you get, and what did you think? As always, if this post has tempted you into signing up for monthly Julep Maven deliveries (which, just to be clear, do not include mystery boxes like the ones I've written about here -- these are optional totally separate purchases), please feel free to subscribe using my referral link. Plus, if you use code FREEBOX at checkout, you'll get your first box for a mere $3.99 shipping and handling fee.